Can You Imagine a portable, battery operated display which will respond to you touch or dance to your music? We did. The battery operated flat panel Lumin Disk responds to your touch or dances to you music or you can just watch it put on a stunning plasma light show. The Lumin Disc looks great on any table or desktop or hangs easily on a wall with its built in keyhole hanger. Great for parties and get together or quiet personal enjoyment. 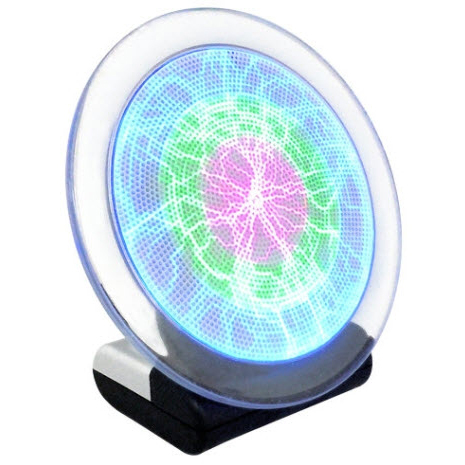 The Lumin Disk uses super bright technology combined with miniature electronics on a flat panel disk with an amazing display of light which will respond to your touch or dance to your music. The Lumin Disk looks great on any table or desktop or hangs easily on a wall with its built-in keyhole hanger. Great for parties and get-togethers or quiet personal enjoyment. The Lumin Disk can either be used by battery or AC adapter which is included. Requires 4 AA batteries that are not included.